The second trip of the day was to Blackness Castle. It is called the ship that never sailed as it is built in the shape of a ship. The castle is situated on the shore of the river Forth. It was even more windy here but we still manage to venture for a walk around the walls. When visiting locations I like to think how they were used for filming. The courtyard in the castle is very rocky so it would have made for interesting transformation into the crowd scenes of the flogging. Only Jamie and Claire made an appearance here. Again like Doune castle there were several visitors at Blackness Castle on a very windy day. Inverness is where we stayed on our Outlander adventure to the highlands. It features in the books. Inverness Castle is used as council offices. There are great views up at the castle plus a statue of Flora MacDonald – she helped Bonnie Prince Charlie. Inverness Castle was originally a 12th century earth and timber enclosure fortress, founded by King David I. In the early 14th century during the Wars of Independence, English troops under King Edward I occupied the castle, which was taken and destroyed by King Robert the Bruce in 1310. In the early 15th century Alexander, earl of Mar, founded a stone castle on the hill and in the 16th century George Gordon, earl of Huntly added a high square stone tower. Seizes and badly damaged by the Royalists in 1649, from 1653-8 Cromwell’s Fort was built at the mouth of the River Ness. In 1726, General Wade transformed the castle into the square Hanoverian Fort George, with a governor’s house and a chapel, encased by barracks. Surrendered to the Jacobite army of Prince Charles Edwards Stuart in 1746, the castle was blown up after the Battle of Culloden. A dramatic mid 19th century neo-Norman castle now stands on the site, built to house the Sheriff Courthouse and County Hall and all that remains of the medieval castle are a deep resorted well and part of the bastion wall. The next stop was to Clava Cairns. Clava Cairns come in two types, and both are represented in the group of three you find in the truly wonderful wooded setting at Balnuaran. There are larger prehistoric sites in Scotland, and there are much better known ones: but we have yet to come across one with such variety and interest in such a beautiful setting. The North East and South West Cairns are knows as passage graves. Here the inner chamber remains linked to the outside world by a passage. Both are no more than a metre or so in height, but when originally constructed the cairns are likely to have been around 3m or 10ft in height. The North East Passage Grave (the one nearest the car park) is interesting in having a large number of “cup” marks and some “ring” marks inscribed on one of the kerb stones. Both of the passage graves have a surrounding circle of widely spaced standing stones: though sadly the stone circle surrounding the South West Passage Grave has a road going through it, leaving one stone marooned on the far side of the road and another forming part of the fence. The central cairn at Balnuaran is of the second type of Clava Cairn, a ring cairn. This differs from the other two in having no passageway linking the central camber with the outside. Like the others it is surrounded by a ring of standing stones, nine in this case, of which some have been broken. One unusual feature is the way that the central cairn is linked to three of its enclosing circle of standing stones by lines of turf covered stones. No-one knows their purpose, and it might well be possible that they were added very much later than the date of construction of the cairns. Another later addition is likely to have been the much smaller ring of kerb stones on the north east side of the site not far from the central cairn. 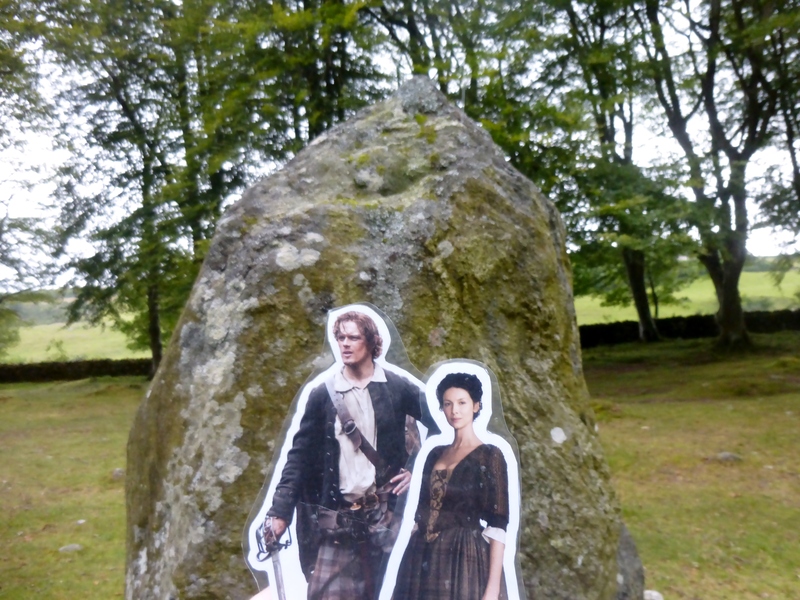 Of course Jamie and Claire made an appearance. We then went back later in the day to see the cairns at sunset. In Inverness for the weekend so first place to visit was Culloden visitors centre and battlefield. This was my third visit each time I learn more and I find the battlefield moving. The centre shows the build up to the battle from the government and Jacobite sides. The battle of Culloden took place on April 16th 1746. Bombarded by cannon shot and mortar bombs, the Jacobite clans held back, waiting for the order to attack. At last they moved forwards, through hail, smoke, murderous gunfire and grapeshot. Around eighty paces from their enemy they started to fire their muskets and charged. Some fought ferociously. Others never reached their goal. The government troops had finally worked out bayonet tactics to challenge the dreaded Highland charge and broadsword. The Jacobites lost momentum, wavered, then fled. In 1881 Daniel Forbes erected a memorial cairn and headstones for the various clans that fell at Culloden.